The Pickle Barrel House is one of the most unique structures in the country. 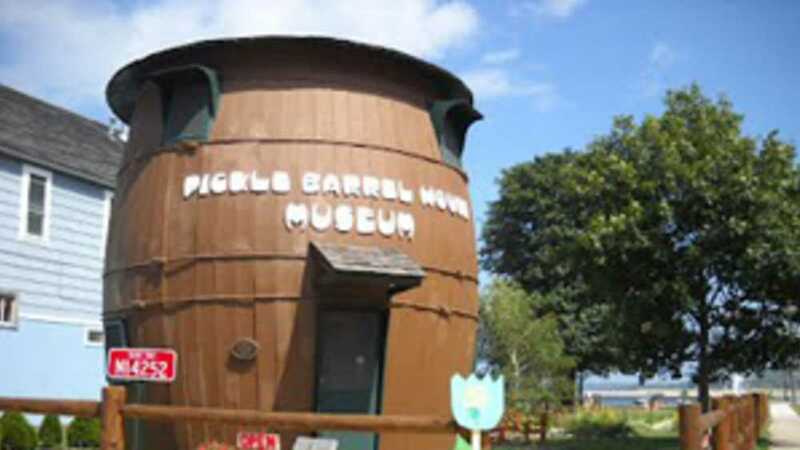 This larger-than-life pickle barrel was originally built in 1926 by the Pioneer Cooperage Company as a summer home for cartoonist William Donahey. Donahey, the creator of the Chicago Tribune's popular "Teenie Weenie" cartoon strip, also drew advertisements for pickle-peddlers Reid-Murdock & Co., who sold their product in a much smaller version of the barrel you see here. The cottage, which contains a living area, pantry, kitchen, and bedroom, stood on the shore of Sable Lake until 1937, when the house was moved into Grand Marais and placed on the corner of Lake Avenue and Randolph Street. For years it was a visitors information center, ice cream stand, and gift shop, and in 2003 the Historical Society purchased the building. It has been restored to its original condition as a summer cottage of the 1920s. Don't miss this very special place. Kids especially love it! Museum is also on the National Register of Historic Places. Open weekends from 1-4pm during the months of June & September, and is open daily from 1-4pm during July & August.